I find that after releasing a game, there is an adrenaline rush of fulfillment that makes me want to immediately release something else. It’s incredibly fun putting a game out into the world – watching people play it, seeing reviews come in, and even just absolving yourself of the responsibility to keep working on the thing. Just a few days after pushing the final(ish) patches for Bucket Detective, I began searching for my next project. I wanted to make another game, a bigger one, or so I thought. I made a bunch of paper prototypes and even built a digital one with a programmer friend of mine. 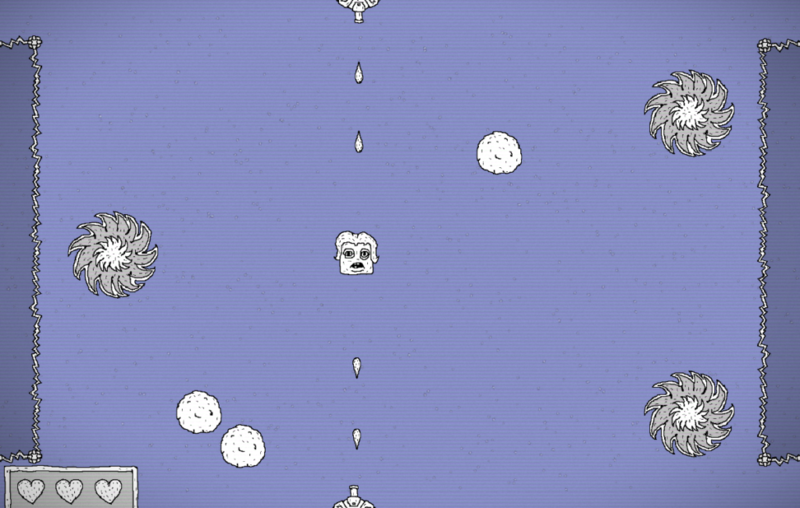 It was a weird, experimental shooter, which you can see a screenshot of below. I quickly realized, however, that I wasn’t ready to jump back into making games. There’s the ideal self and the self as you really are, and the divide is a killer. I needed time AWAY from making games, or at least away from my own games, so I decided not to pressure myself into working on anything I didn’t want to work on. I’m in my final semester of a game design masters program, so lately a lot of my time has gone to that. I’ve been writing my thesis (a post-mortem analysis of Bucket Detective) and taking my final annoying required courses (professional legal skills, academic writing, Finnish, etc). On top of that I’ve been looking for jobs. I put together a portfolio of work done in the past few years which I felt was professionally presentable (this unfortunately left out a ton of student projects). I had hoped Bucket Detective would make enough money that I could support myself, but that doesn’t seem to be happening. At first I was bummed, but I’m actually looking at it as a gift. Trying to make art and trying to make money… they just don’t mix. And after going through the process of Bucket Detective, I realized I’m actually not that interested to turn my personal projects into a source of income. I make things because I like to make them and I like the freedom to make whatever feels interesting to me in a given moment. If I were paying my bills with the games I make, that freedom would be diminished. Having a job, a guaranteed source of income, means that my projects will be a success even if they make no money. And luckily, it seems I’ll be working in games, albeit on other people’s games, so the work will still be interesting and allow me to deepen my craft. Maybe this is a way of deluding myself, but hey, constructive delusions are the secret to happiness. Lately, I’ve gotten back into writing. I sketched an outline for a feature film. I’ve written random bits of a novel and a few half-baked short stories. I also have a cool game I’ve done rough designs for – a game which I imagine will be the thing I make after I get over my game development burn out. For now I’m content to experiment and focus on making things for fun. No big projects. No commitments or expectations.